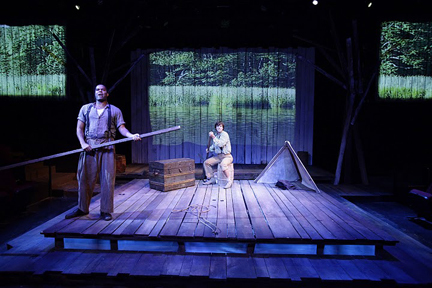 The mighty Mississippi is rolling across the stage at Lyric Stage Company of Boston as the venerable company begins its 38th season with a production of "Big River: The Adventures of Huckleberry Finn." Comparisons to last season's magnificent production of "The Life and Adventures of Nicholas Nickleby" are inevitable as the shows offer similarities in origin and style. While each production stands on its own merits, both are based on classic literature we all read long ago in school. Both have large ensemble casts with several members of the company doubling roles. Both feature narration from the main character. And both are directed by Producing Artistic Director Spiro Veloudos, who keeps the players on their toes as they move the story along. 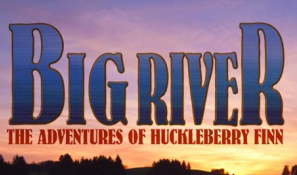 Unlike "Nickleby," "Big River" is a musical. Set in Missouri in the 1830s, the show's book is by William Hauptman based on the 1884 work of Mark Twain, with music and lyrics by Roger Miller, who reigned as a country singer-songwriter back in the 60s ("King of the Road," "Dang Me"). With no mother and a drunken, vagrant father, Huckleberry Finn is being raised by the Widow Douglas and her sister Miss Watson. When he's forced to live with his father (who's only after the money Huck has saved), Huck fakes his own death and escapes, leaving him free to pursue new adventures. Unbeknownst to Huck, Jim, slave of the Widow Douglas, is also off on his own. He escaped after hearing he was about to be sold for $800. When the two meet up by chance, they decide to head off together on a raft down the Mississippi. Huck is heading wherever his perilous journey takes him, while Jim aims to get to the free land of Ohio where he can reunite his wife and two children. As they stay one step ahead of capture, they meet two theatrical scalawags who are always up to no good, Huck crashes a funeral, impersonates his friend Tom Sawyer and learns a few lessons about the larger world. While all of Miller's music is bright and pleasant, the country-flavored songs have an almost interchangeable feeling to them. Still, "River In The Rain," "Muddy Water" and "Leavin's Not the Only Way to Go" are all nicely delivered. Huck and Jim share a bonding moment with "World's Apart." Jordan Ahnquist is a gosh-golly sort of Huck, hitching up his jeans and fixin' to see the world. (He'd make a great John-Boy if "The Waltons" ever made it to the stage.) During the course of the evening, Huck develops an expanded vision and comes to see Jim as a human being rather than a possession. Audiences who saw Ahnquist deliver a great performance last season in [title of show] at SpeakEasy will enjoying seeing him in this very different role. He has a touching moment with the simple ballad "Waiting For The Light To Shine." As Jim, De’Lon Grant is the gentle giant who's suffered the loss of family and freedom and is still determined to retrieve both. Grant plays the role with grounded honesty and integrity. His dream of a better future is captured in "Free At Last." The theatrical scam artists are played by J. T. Turner and Peter Carey. Both tackle their roles with humor and gusto, especially when they present a horrendous version of Shakespeare to a crowd that eventually turns on them. The company is rounded out by Maureen Keiller (as the widow Douglas and an almost indiscernible old woman), Leigh Barrett (as Miss Watson and later as Sally Phelps), Paul D. Farwell as the brutal Pap and Phil Tayler as a feisty Tom Sawyer, always looking to blow things out of proportion. Nicholas Lee adds a particularly bright moment to the comical proceedings as a boy who dearly loves Arkansas. Designer Janie E. Howland's has given Veloudos a simple but highly effective playing field, anchored by a gigantic whitewashed fence upstage that splits into barn doors for smaller set pieces to slide on and off. (Note the subtle way the pieces are pushed on stage.) The main playing platform serves multiple purposes. With the repositioning of one simple panel, the entire stage turns into a floating raft that's lit from beneath by lighting designer Scott Clyve. And finally, the production has been blessed with projections designed by Seághan McKay. Initially, McKay uses black and white wood block prints to illustrate Huck's world. But when the story hits the river, video is utilized to remarkable effect. We also go from black and white to muted color. Two side stage panels above the audience add to the experience. All of this artfully expands the look and feel of the show without ever falling into the "look what I can do" trap. Even so, Lyric starts off the new season with a loving nod to a story that has long been part of the American literary landscape. 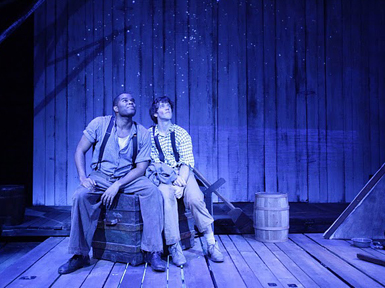 "Big River " is at Lyric Stage Company of Boston through October 8. For information, call 617-585-5678.